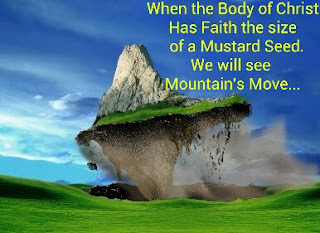 Christian Poets and Writers: When the Body of Christ See's Mountain's Move! When the Body of Christ See's Mountain's Move! Have you ever realized the smarter we get, the more problems we have? I think there are more diseases and conditions in our world today, than we have body parts. Unfortunately, fear rules the world today, we have too much awareness of our problems, and not enough awareness of God! God still rules!!! And He chooses to rule through Christ, the head of the Church, and His Body, Christian's. As believer's we are responsible for allowing Christ to do what He says He can do through us. And we do this by faith. Faith in God! My biggest concern nowadays is not who will be the next president, what disease I may have, or if terrorist will take over the world. My biggest concern is the lack of faith in God. God is the answer to all these problems, and all other problems, and He supplies the solution to them, by Christ Jesus. Here's the catch! In order for Christ to deliver the desired result to the world, His body (Christian's) are responsible for carrying out the solution to the rest of the world by their faith in God. Just like when we decide to walk, our body has to carry out our head's request. Our individual faith is but one cell in the Body of Christ, and can do wonders in our own life, but in order to change the world it will take the collective faith of the Body of Christ. When the collective faith of the Body of Christ reaches a majority share, we will see God moving on earth again, through Jesus the Head, and His Body, us. We will then do greater works than Jesus did while He was here on earth!!! We need to realize there is still Divine Intervention in our world when needed, just like in biblical times, but God's chosen way to work today is through His Son...Jesus Christ...and His Body...us. Let's take our role seriously, allowing God to walk on earth again, performing miracle after miracle, healing after healing, and allowing the whole world to see, Jesus is Lord!! !